Cinemablographer: Oscars 2013: And the Best Film Wins! It was such a strong competition, in fact, that a few guests at the party I attended were switching votes in the Oscar pool mid-ceremony. “When in doubt, vote Gravity,” became the fun mantra of the evening, although it ultimately backfired in the end. I won the pool with a decent, but not great, score of 20/24 predictions, as I missed Original Screenplay, Film Editing, and Live and Animated Shorts. (The hat, on the other hand, scored a paltry 4/24.) The folks at our Oscar party seemed to have as good a time as the ones at Ellen’s event did, for we had a decent spread of Oscar-themed food. 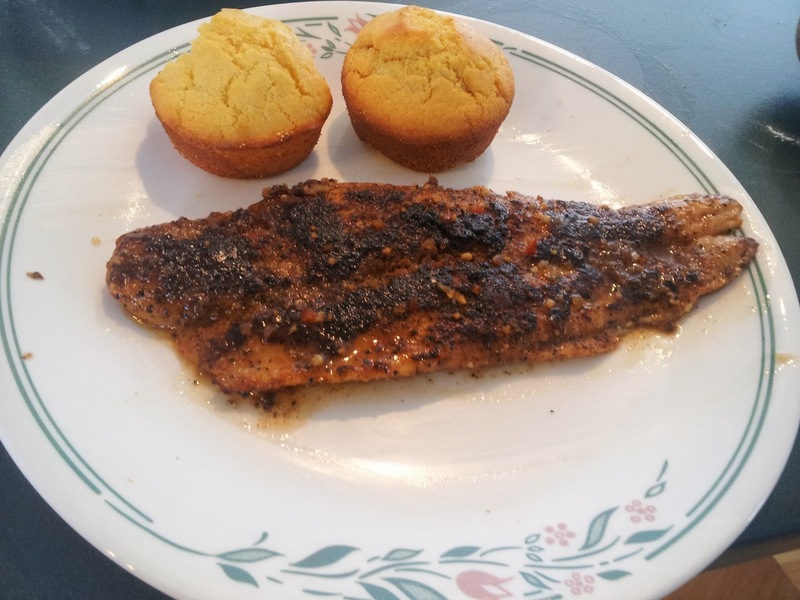 I made catfish and cornbread to represent August: Osage County and 12 Years a Slave, respectively. Other Oscar-themed foods at the party included a three-course menu for The Wolf of Wall Street with tasty battered smelts (a nod to Jonah Hill’s goldfish eating scene), a lemon pie (which was really good), and a big bowl of Quaaludes (re: scotch mints). 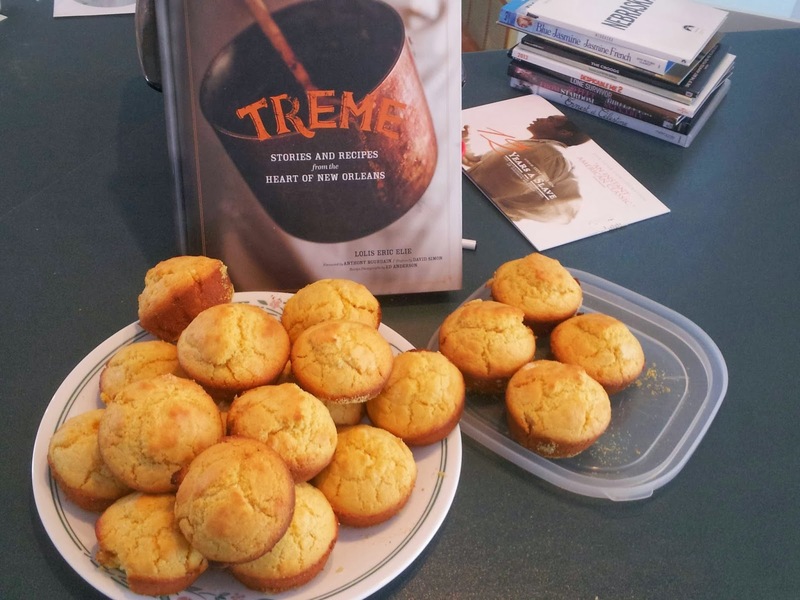 There were also cupcakes for Her and a mix of Best Picture popcorns that included a sea salt and honey blend for Captain Phillips, an out-of-this-world chocolate popcorn for Gravity, and my favourite, an Irish cheese and bacon popcorn for Philomena. A veggie meatloaf for Nebraska made it to the party just after the ceremony began, too, while Bambino in American Hustle tumblers livened up the Oscar pre-show. It was a good show for Meryl fans even though Streep didn’t take home the prize, which went to the long-presumed winner and much-deserving Cate Blanchett for her performance in Blue Jasmine. Streep might have earned more airtime than most of the other nominees, as she offered some of the show’s highlights by giving Pharrell a shake during his performance of “Happy” and by joining in the group selfie with Ellen and company. Folks should nominate her more often! 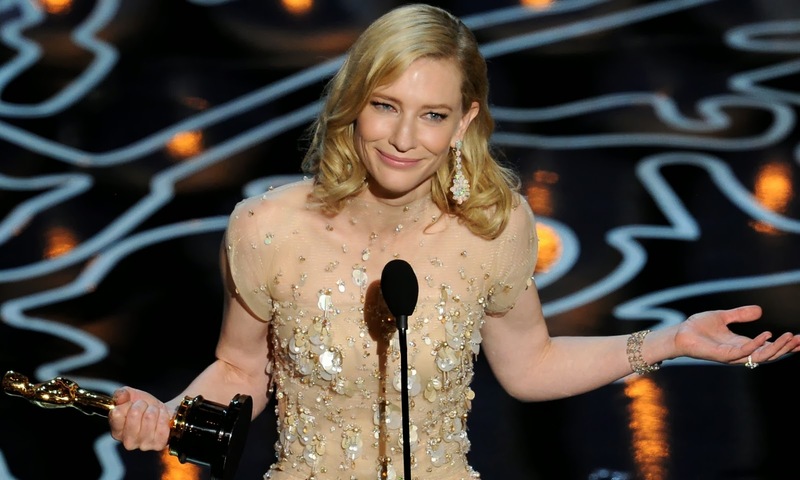 Blanchett, on the other hand, offered one of the night’s better speeches from the winners’ circle. Thankfully taking the time to note the efforts of Woody Allen, whom some speculated she might try to avoid citing, and praising the roles of her co-nominees, Blanchett used her speech to make a solid point that films led by women can indeed make money. Her shout-out to Sally Hawkins was much appreciated and her final nod of thanks to the Sydney Theatre Company was a fine nod to the theatrical experience that helped make her Blanche Dubois-infused performance such a stunner. The other winners of the acting prizes ranged from one of the night’s most squeamish speeches to one that had party guests in tears. The gong might go to Matthew McConaughey’s bizarre, rambling speech for his win for Dallas Buyers Club. McConaughey fumbled after a season of entertaining and gracious thank you speeches by going on about God and calling himself his own hero. (I can appreciate that a winner must be in a daze, but it was just a weird speech.) McConaughey’s Dallas Buyers Club co-star Jared Leto started the night with a mixed bag of a speech when he scooped Best Supporting Actor for his performance as transgendered AIDS patient Rayon and made a touching point by taking his mother, but he then plugged his band, and rambled on into “give him the hook territory” before acknowledging real-life heroes in a finish that redeemed the speech. The night’s other big winner, 12 Years a Slave’s Lupita Nyong’o, also spoke at length without being played off, but her speech was easily the best of the night and could have gone on for as long as she pleased. Nyong’o was adorable and eloquent as she received the prize and earned a standing ovation. Nyong’o began by saluting her character Patsey and delivered a sincere point in conveying the cultural, social, and cinematic significance of 12 Years a Slave before urging viewers to follow their dreams. 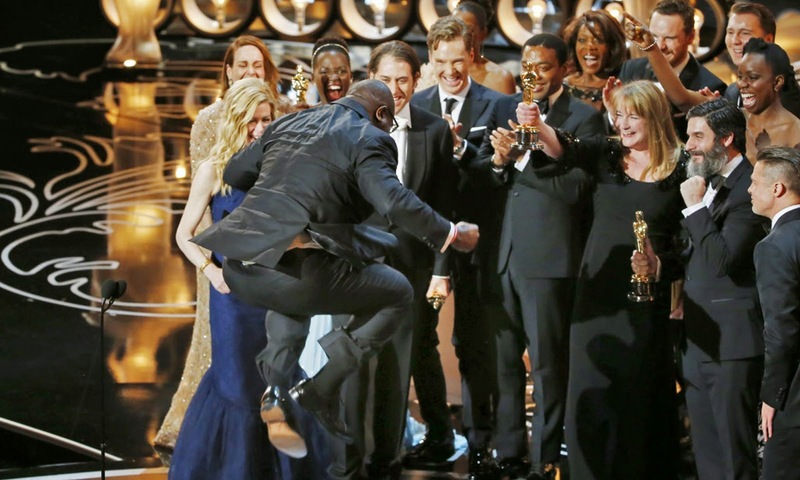 Nyong’o’s win marked a necessary prize for 12 Years a Slave over fellow Gravity rival American Hustle. The stiff competition between Nyong’o and Hustle’s Jennifer Lawrence seemed like an important indicator for Slave’s chances at winning Best Picture. American Hustle, surprisingly, went home empty-handed and joined the likes of Gangs of New York and True Grit to go zero for ten at the Oscars. The prize seemed uncertain for Slave in the final days, for numerous anonymous reports from Oscar voters admitted to having skipped 12 Years a Slave because they didn’t think they could handle it. 12 Years a Slave’s overall triumph, though, marks a notable step for the Academy, which often shies away from acknowledging controversial and provocative filmmaking in favour of mainstream entertainment. The win also marks an important step for diversity in the Academy’s history, as does the Best Director Oscar for Alfonso Cuarón, who is the first Hispanic director to win the prize. Slave’s win also boosts the stock of the Toronto International Film Festival, as it became an Oscar frontrunner after winning the People’s Choice Award at TIFF last fall. 12 Years a Slave joins The King’s Speech, Slumdog Millionaire, and American Beauty as films to win Best Picture after receiving the endorsement from Toronto audiences. Triple Oscar-winner Dallas Buyers Club also premiered at TIFF 2013, so the festival’s track record as an Oscar Launchpad continues. Other notable highlights among the winners were the well-deserved prize for Best Documentary Feature, which rightfully went to 20 Feet from Stardom, and Italy’s win for Best Foreign Language Film for The Great Beauty (I would have given it to Belgium’s The Broken Circle Breakdown, but Beauty is a strong choice) and the Kristen Anderson-Lopez and Robert Lopez’s rhyming acceptance speech for Best Song for Frozen’s “Let it Go.” Idina Menzel’s performance of “Let it Go” was a highlight for the show’s entertainment value, as was Pink’s strong rendition of “Over the Rainbow” to mark the seventy-fifth anniversary of The Wizard of Oz. The Wizard of Oz also gave Ellen one of her best zingers as host when she roasted the impressive male Liza Minnelli impersonator. Ellen’s second stint as Oscar host was a lot of fun, as she filled the night with safe, quirky humour. Her joke with Jennifer Lawrence’s serial tripping was Ellen-ish fun, but the pizza gag and the selfie (plus her appearance as Glinda) were the highlights of her hosting duties because she interacted with the stars and made the night all about the nominees. Despite a few prompter guffaws and some unnecessary montages, Ellen gave the movie year a show it deserved. 12 Years a Slave won and the Oscars were basically The Meryl Show... all in all I'm happy with how the year went down. - Brad Pitt, Dede Gardener, Steve McQueen, Jeremy Kleiner, Anthony Katagas; producers.